Mundorf is regarded as specialist in high-end components. We have, therefore, listed the most interesting ones below. 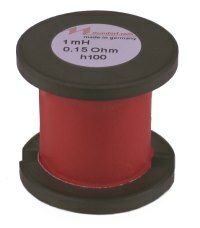 All listed coils are made of copper lacquer wire with a purity of > 99.99%. The wire ends are tinned and labelled. Inductance is measured at 25 degrees Celsius; tolerance is +/- 3%. L denotes inductance, R the DC resistance, D the diameter, Le the length, W the width, H the height. The high-performance HP 3616 ferrite is the answer for many users need for an inexpensive high-power ferrite material. The mechanical advantages of these relatively small coils are obvious, but it wasn‘t until this new HP 3616 material became available that Mundorf could even consider adding a ferrite core to their product line. This quality material, manufactured in Germany, distinguishes itself from the widely used cheaper cores from the Far East in its high loading capacity. The H-series combines excellent electrical and mechanical specifications with relatively low unit costs. Baked varnish coils of this type can be found at the end of this page. Their product ID starts with "B"